Prime Minister Sheikh Hasina on Wednesday asked all concerned to take a pragmatic approach to reach the birth centenary celebration of Father of the Nation Bangabandhu Sheikh Mujibur Rahman at the grassroots so that the people can know the true history of the Liberation War. 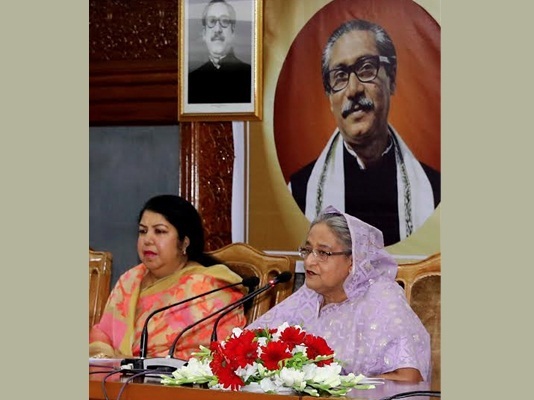 We will take measures to hold the birth centenary celebration of Father of the Nation Bangabandhu Sheikh Mujibur Rahman at the grassroots so that the people can know the true history of Liberation War, she said while presiding over a maiden joint meeting for celebration of birth centenary of Bangabandhu at the Prime Minister’s Office (PMO) this morning. There should be a realistic strategy on how the life and works of Bangabandhu would be projected to the next generation in a proper manner so that they can get encouragement to engage themselves in welfare of the nation, following Bangabandhu’s ideals, she mentioned. In an apparent reference to BNP-Jamaat clique, the premier said that They have tried to erase the contribution of Father of the Nation Bangabandhu Sheikh Mujibur Rahman in Language Movement and the Liberation War as well. People could not know Bangabandhu’s contribution for 21 years. But, truth can never be suppressed by anyone. Truth must come into light and takes its position and now we are getting the proof of it, she mentioned. The premier reiterated her commitment to building a ‘Sonar Bangladesh’ freeing from hunger, poverty and illiteracy as dreamt by Father of the Nation Bangabandhu Sheikh Mujibur Rahman. Bangladesh is going ahead with the ideals of Father of the Nation to turn Bangabandhu’s dream into a reality, she said, adding that per capita income has already reached $1909 and the growth of GDP (Gross Domestic Product) is forecasted to cross 8 percent. Highlighting the contribution of Father of the Nation, the prime minister said Bangabandhu had got just only three and a half years time and by this time, he rebuilt the war-ravaged country and shaped Bangladesh as an independent nation. Bangabandhu had given the political liberty and taken initiatives for giving economic emancipation by taking all measures to turn a province into a country with giving a constitution to run it, she continued. She said Bangladesh would successfully celebrate the birth centenary of Father of the Nation in 2020 and golden jubilee of the Independence in 2021. The government has already declared 2020-2021 as ‘Mujib Barsha’, she went on saying. Sheikh Hasina said the committees and sub-committees will be formed as per the recommendations of two committees formed for making Bangabandhu’s birth centenary celebration a success. National Professor Dr Anisuzzaman was present on the dais. Speaker Dr. Shirin Sharmin Chaudhury, Chief Justice Syed Mahmud Hossain, former Finance Minister AMA Muhith and Birth Centenary Celebration National Implementation Committee President National Professor Rafiqul Islam were also present on the dais and spoke on the occasion as members of the committees. Among others, AL Advisory Council Members Amir Hossain Amu, and Tofail Ahmed, Presidium Members Sheikh Fazlul Karim Selim and Matia Chowdhury, Workers Party of Bangladesh President Rashed Khan Menon and JaSoD President Hasanul Haq Inu, gave their opinions as members of the committees. Members of the Nationwide Celebration of the Birth Centenary of Bangabandhu and also PM’s former principal secretary Dr Kamal Abdul Naser Chowdhury conducted the meeting.